Fashion designer at work. Small fashion designer start up. Chinese female working in her home office. Start up concepts. 4k00:08Fashion designer at work. Young chinese fashion designer and tailor talking to customer at her home office. Small business start up concept. 4k00:10Fashion designer start up. Young asian female fashion design in small office, talking to customer over phone and looking at computer. New business start up concept. 4k00:10Fashion designer at work. Young chinese fashion designer and tailor writing and typing on her laptop at her home office. Small business start up concept. 4k00:08Fashion designer start up. Young asian female fashion design in small office, talking to customer over phone and looking at computer. New business start up concept. 4k00:10Asian businessman sitting in modern office and writing something on paper. 4k00:09Fashion designer start up. 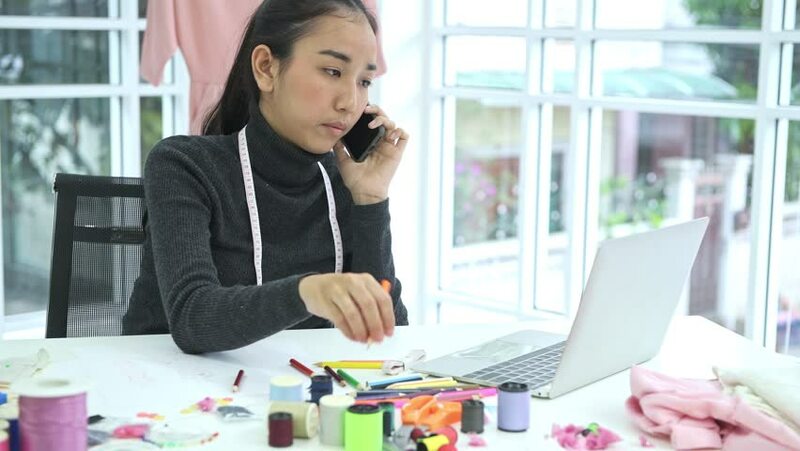 Young asian female fashion design in small office, talking to customer over phone and happy ending. New business start up concept. 4k00:15Fashion designer start up. Young asian female fashion design in small office, Live broadcast for vlogging. New business start up concept. 4k00:12Fashion designer start up. Young asian male and female fashion designers in small office, working together. New business start up concept. 4k00:11Fashion designer at work. Small fashion designer start up. Chinese female working in her home office. Start up concepts. 4k00:15Fashion designer at work. Small fashion designer start up. Chinese female working in her home office. Start up concepts. 4k00:15Fashion designer at work. Young chinese gay man and woman fashion designer and tailor drawing design concept in note book at their home office. Small business start up concept. 4k00:09Fashion designer at work. Young chinese gay man and woman fashion designer and tailor drawing design concept in note book at their home office. Small business start up concept.